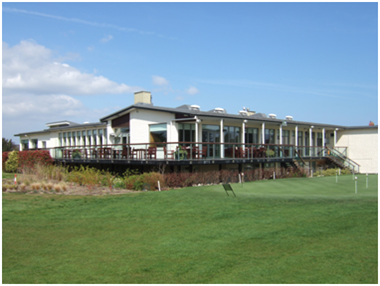 There have been three interesting Rules incidents in my own Golf Club in the past few weeks that I think may be of interest to you. The first situation concerned a junior who, in a stroke play competition, thinned his ball over the green into an out of bounds area. Unfortunately, he did not realise that his ball was out of bounds and played it from there back onto the putting green. At this point he was advised that he had played his ball from an area that was out of bounds. Then he correctly picked up his ball and returned to the place where he had previously thinned his shot to the green and dropped it there. However, he was unsure what penalties he had incurred. Because his ball lying out of bounds was no longer in play he had played a ‘wrong ball’ (see the Definition). Accordingly, he incurred a two-stroke penalty, in addition to the stroke and distance penalty, making three penalty strokes (Decision 15-6). It is worth emphasising that the only way to proceed when your ball has come to rest out of bounds is to return to where you last played from, under penalty of stroke and distance. If the junior had failed to rectify his error, by returning to where he had played his previous stroke, the Committee would have no alternative but to disqualify him from the competition. The previous week, in a strokes competition, the team with the winning score were initially disqualified because, whilst everything else was correct on their score card (names, handicaps, the players gross scores and the required signatures), there was no date on it. They had been given a dated card at the Pro Shop but had returned a different one at the end of their round. I was able to advise the Committee that there is no Rule of Golf requiring the date to be on the score card when it is returned. Decision 6-6a/7 confirms that the player(s) may return a different card from the one issued by the Committee at the start of the round. When you think about it this is logical. For example, the original score card may have been lost or the scores become illegible due to wet weather. 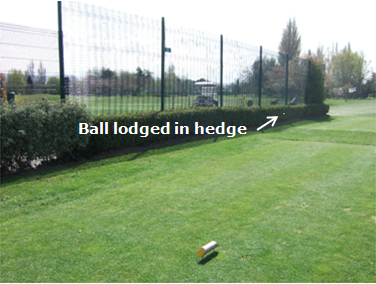 In the circumstance described above, the fact that the ball is lodged in the hedge obviously means that it would be unreasonable for the player to make a stroke and so the relief from the wire fence is not available. The player must deem their ball unplayable and take one of the options available under Rule 28, under penalty of one stroke. Remember, that if you are not playing to the Rules of Golf you are not playing golf. Regarding the ball hit thin and over the green ob: There's no need for the committee to decide whether any significant advantage was gained by the player. If he didn't correct the wrong ball error and teed off on the next hole he is dq'd--Rule 15-3b. You are correct, of course. I was mistakenly thinking of 'playing from a wrong place' rather than 'playing a wrong ball'. I have now edited the last sentence of the second paragraph accordingly. Thanks for your answers to my previous questions. It is much appreciated. I have another one regarding trees that are rooted out of bounds. If my ball gets stuck in a tree that grows out of bounds, but the location it gets stuck on is on a branch which extends in bounds - then what do I do? Is my ball out of bounds so I have to take a penalty of stroke and distance or can I declare it unplayable and drop it on the spot right underneath the tree? And can you cite any other practical examples of the fact that the out of bounds line extends vertically upwards and downwards? At my club we are a bit puzzled by this.